From the 13 to the 16 September, Lisbon will host the third ON STAGE event and with it we are honored to inaugurate the fall season of choral singing events. The new project of INTERKULTUR – ON STAGE unites the passion for travel with the passion for music. ON STAGE is a non-competitive INTERKULTUR event that makes possible the combination of traveling to your favorite cities, performing with foreign choirs, participating in workshops and getting to know the country; its history, culture and local traditions. In summary, it is an ideal event to combine music with travel, learning and new experiences. ON STAGE includes touristic activities (sight-seeing), short concerts in touristic places (churches, halls), a workshop with a local choir and at least one concert by all the participants. In addition, we are happy to have one of the most exciting and charismatic directors in Portugal, Mr. Myguel Santos e Castro as a teacher for the workshop that will be held at the ON STAGE in Lisbon. Lisbon is a city built on seven hills that extends along the coast of the Atlantic Ocean and is the land of great discoverers such as Vasco de Gama, Magellan and Prince Enrique, El Navegante. No other European city presents such an intricate mixture of the old and the new, nor so many faces. Therefore, it is ideal to explore calmly, get lost in it and discover a good amount of amazing landscapes and characteristic monuments. It is already the third consecutive year in which this fantastic event will take place. 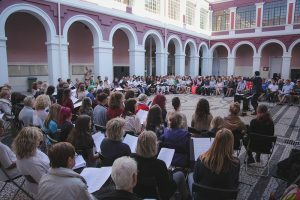 In the past September of 2017 the ON STAGE Lisboa event was already held in which 7 choirs from 7 different nationalities participated; Singakademie Frankfurt (Oder) e.V. (Germany), Jalasjärven nuorisokuoro (Finland), Ajayi Crowther University Chorale (Nigeria), Ukmerges Kulturos center moteru vokalinis ansamblis “Cantilena” (Lithuania), Carlos Gomes Choir, ITL Segakoor (Estonia) and emCANTUS – Associação Coral de Odivelas de Portugal. The event was a success and received very good reviews from all participants, so we hope it will be repeated in this next edition in September 2018.